Checking Out the Respect the District Installation at 14th & Irving | Park View, D.C.
Over the weekend I saw the following installation at the southwest corner of 14th and Irving streets, NW, which I guess has been there since January 10th. In checking out @RespecttheDistrict‘s Twitter profile, it states the following — The Respect Flag at 14th & Irving in DC. Designed by emzki. Connect your stories & selfies taken through the stars. #harassmentfreedc Respect! 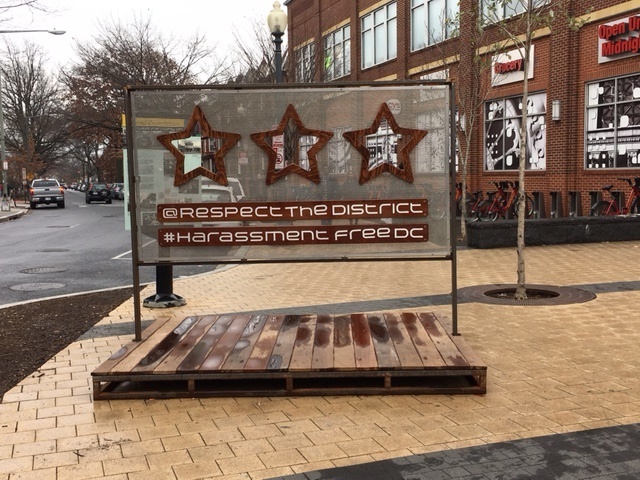 This art installation is connected to Vision Zero DC, and is their 2nd public art installation aimed at preventing Street Harassment. This entry was posted on February 13, 2017 at 7:01 am and is filed under Art, Public sculpture. You can subscribe via RSS 2.0 feed to this post's comments. Am also glad, impressed that people are addressing street harassment.. unfortunately I often have to protect the young women on my staff from “store” harassment…sometimes hard to believe that in 2017 we STILL have to fight this battle.